~Eric Harkins, CEO, demonstrates the FLIR thermal camera used for roofing & solar inspections. The State Newspaper, based in Columbia, is one of South Carolina’s widest distributed news papers. 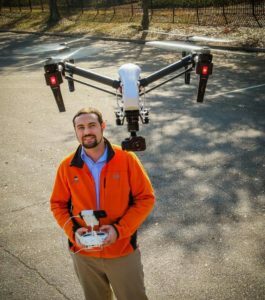 We were pleased to be featured on the front page of the business section this year for Back Forty Aerial Solutions work developing the drone services industry in Columbia and in South Carolina at large.